We’ve all heard the saying “The customer is always right”. Unfortunately that is not always the case in the real world. There are many types of behavior that are not acceptable in society today and regardless of the relationship between 2 people, must not be tolerated regardless of the consequences. The question for each of us is how much of this type of situation we are willing to put up with. 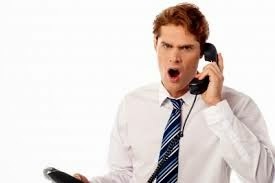 We’ve all had clients that were rude and over demanding but where should we draw the line and say enough is enough? To start with I would say that a client that is difficult to work with and impossible to please might not be worthy of our time. After all, if you have done everything humanly possible to satisfy this particular client but they want more, what choice do you have? There’s no sense in wasting both your time and theirs if in the end (if you get that far) they are still not pleased with your service. The truth is that some people are never happy regardless of your best efforts. And what about a client that is downright uncivil, even to the point of being insulting and condescending? This is not something that happens every day but it does happen and I am of the firm belief that everyone deserves a certain level of respect regardless of circumstance or position. No one should put up with such mistreatment from a client under any circumstances. Finally, what about a client that makes you feel personally uncomfortable? The ladies might understand this statement better than the men but I’m sure that everyone reading this has been in a room at least once with someone that just, well, gave you the “creeps”. You couldn’t put your finger on it but something about them was unsettling, possibly even dangerous and you could not wait to get away from them. Regardless of the amount of money involved this is the type of person that we may not want to be involved with on any level. I have learned that more often than not our “6th sense” is correct. The bottom line is that there are times that it is appropriate (and indeed wise) to fire a client. It’s all about weighing the costs. There’s no sense in wasting time with an over demanding customer that in the end may not be worth the investment. The emotional price of dealing with such a person may also be too high. The thing that we as realtors fear the most is the negative word-of-mouth that might result from letting a client go. It’s a sure bet that this is what will happen in this situation but I believe that the same thing will happen if you don’t let them go. With some people it’s a no win situation regardless of your actions and the end result will always be the same. It might help you to know that people of this character type are often dismissed by friends and colleagues that know them well and their words will be much less damaging than you might imagine. It’s also important to remember that some customers are so taxing that they can actually affect the way that you deal with other clients and associates. Nothing can drain enthusiasm more than an obnoxious client and the feeling can be contagious to coworkers as well. In the end it is best to say goodbye as soon as possible to at least minimize the effect on morale. It goes without saying that handling this type of goodbye is tense at best and downright explosive in the worst case scenario. I would suggest providing the client with a rational explanation such as “Our limited resources will no longer allow us to provide you with the level of service that you require” or something equally tactful in nature. That might be your best chance of ending a toxic relationship with as little turmoil as possible. In either case it is important to see it through to the end and rid your business of a client that is unhealthy for all involved.